Our Funarena! : Bizarre Happenings: Politics Of The Absurd! President of any country is the honorable first citizen of that country and election of such a personality ought to be honorable and prestigious too. But Indian politics continues to defy all thoughts of any honor. Bizarre happenings are the order of the day to corner a weak coalition government and capitalize on the chances of a mid-term poll. 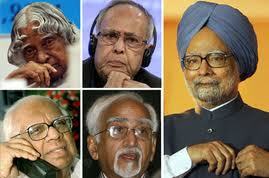 That the Indian President is to be elected hardly makes any difference to any politician. India is set to elect the 13th President of the country on July 19, 2012 with results coming out on July 22 as the current President Pratibha Patil will be ending her term on July 24, 2012. For the last two months politicking has been going on to suggest possible candidates with unholy differentiations of ‘theirs’ and ‘ours’. For the first citizen politics has been of the third kind! The main national opposition party was the first to start the process by suggesting the candidature of APJ Abdul Kalam (President for 2002-2007) for a second term. While there was no doubt about the worthiness of this brilliant scientist the party not only not consult their allies but even did not inform or get the consent of the candidate concerned. The Congress party—mainstay of the ruling coalition—had been discussing names like that of the current finance minister Pranab Mukherjee, current Vice-President Hamid Ansari and a few others. In fact, Pranab Mukherjee was slowly emerging as the consensus candidate as nobody irrespective political affiliations could ever question his experience, dexterity and statesmanship. On the contrary, a few coalition leaders were questioning the advisability of his candidature since by that decision the coalition government would be losing the services of one of its most seasoned politicians. But ‘their’ candidates could not be ‘ours’, opposition political parties thought. And, in came Mamata Banerji who had already earned quite a name for creating headlines for all wrong reasons in recent times. The irrepressible Chief Minister of West Bengal rejected the coalition candidates outright though her party continued to be a part of it. She rejected even her fellow Bengali leader Pranab Mukherjee, because she reportedly never wanted Congress influence in her state politics. Mind you, her party is Trinamool (grass-root) Congress (T,MC) and not just ‘congress’! To confound the bizarre process of politicking Mamata somehow roped in the veteran Uttar Pradesh leader Mulayam Singh Yadav. His Samajwadi (Socialist) Party being an important ally of the coalition rescued the government out of many tight situations earlier. Maybe the motivation could be his Prime Ministerial dream that leaked out of him when he conferred Chief Minister’s responsibility on his son after the historic Uttar Pradesh elections of 2012. 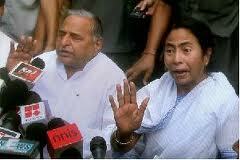 The Mamata-Mulayam duo held a press conference on June 13, 2012 in New Delhi and announced ‘their’ candidates. Former President APJ Abdul Kalam…former Speaker of the lower house of Indian Parliament Somnath Chatterjee…no real problems, though a question struck as to how Mamata could suggest the name of a prominent Left leader like Somnath Chatterjee considering her tirade against the Left calling even for a social boycott against them in West Bengal. The twist came when they floated the name of even the serving Prime Minister of India, Dr. Manmohan Singh, as a Presidential candidate. An eminent economist and a man of honesty and integrity Dr. Singh would have been an ideal choice in any other situation. The politics was clear. Mulayam would thus pursue his dream and Mamata would acquire dictatorial powers in her state and in the country after the consequent mid-term elections for which all manipulative bizarre politics had been orchestrated. All oppositional political parties now think that if mid-term poll happens now they would win hands down. Fact of the matter is no political alliance—coalition or opposition—commands enough numbers to get ‘their’ candidates win. There are cross currents, interdependence and ideological contradictions that are making the process ludicrous and impossible. Yet, politicking never allows anyone to see or realize the pride involved in the Presidential Elections of India-2012. Today while briefing news reporters in Delhi Mamata Banerji openly dared the Congress high command to throw her out of the coalition and face the consequences. She also said that her party’s first choice is APJ Abdul Kalam and no problem if other two candidates got rejected by the Congress. Ironically she talked a lot about the importance of electing the first citizen of the country and added that Kalam’s candidature justified the importance. Incidentally neither Mamata nor Mulayam took a position when the main opposition party unilaterally declared Kalam’s name for the President. Answering pointed questions Mamata had an apparent slip when she blurted out ‘I am a simple man’ and so did not care about any possible threats! Meanwhile the Congress rejected all three names proposed by Mamata-Mulayam and had a core committee meeting today in Delhi. The complex scenario could clear a little by tomorrow. The citizens of the largest democracy of the world would definitely want a worthy person to be their President. The political parties must show sense and sensibility. Bizarre Happenings And Politics of Turmoil! Bizarre Happenings: Scoop, Spook And Coup!